Meet the earrings that you can wear every day, from am - pm. 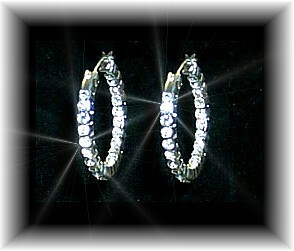 Small, shimmering hoops, with crystal rhinestones on the outside and inside. They're the perfect finishing touch to any outfit from jeans and gym clothes, to work suits and prom gown. Add them daily for a sleek touch of razzle dazzle that will help you feel glamorous, empowered and extremely feminine. Size: 2.5cm (1").